Taiwan recently revised its Labor Standards Act to protect workers interests, but some see it as far too restrictive and lacking in flexibility as businesses reinvent themselves to cope with the arrival of the knowledge economy era. As he discusses Taiwan’s labor regulations with an expression reflecting confusion, he appears lost in the jungle of this perplexing topic. He is Keith Wang, a 35-year-old Silicon Valley entrepreneur who co-founded Pointimize, a platform that helps users maximize the benefits from frequent flyer and hotel reward programs. His company has a Taiwan branch, and what had Wang in a quandary was Taiwan’s Labor Standards Act, the country’s main labor law. “Knowledge economy businesses should use the ‘designated responsibility system.’ New enterprises are desperate for talent. I spend every day thinking about how to make employees feel happier and be more efficient on the job and be willing to continue working with the team,” says Wang, who then hesitates before continuing. Wang, who shuttles between Taiwan and the United States, has trouble understanding how the “designated responsibility system” has become equated with “overwork” in Taiwan. “This job responsibility system is actually better suited for knowledge economy businesses,” he says, hoping to transplant the work culture and environment seen in Silicon Valley to his company in Taiwan. In fairness, labor groups often complain that many companies in Taiwan, including in the high-tech sector, improperly use the “designated responsibility” system to get their employees to work longer hours without having to pay them overtime. 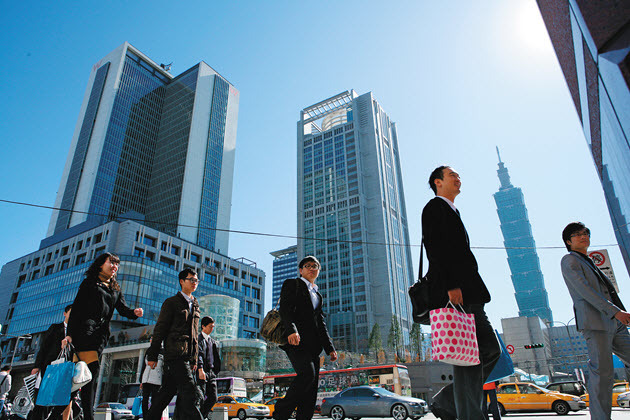 The issue erupted again last year when Taiwan’s government proposed new work rules to standardize a five-day workweek. Under the revisions to the Labor Standards Act, the two days off each week have been labeled as a “flexible” and “mandatory” day off. Employees can work on the “flexible” day off, but overtime pay (the additional amount paid for overtime plus base pay) is onerous, ranging from 2.33 to 2.67 times standard hourly pay. They cannot work on the “mandatory” day off. National labor laws have implications for a country’s economy. So with the government encouraging startups and moving toward a knowledge-economy era, what should the Labor Standards Act’s role be? These amendments to the Labor Standards Act, eventually passed by the Legislature in December 2016, sparked such intense controversy and backlashes from both labor and business groups that they eventually led indirectly to the dismissal of Labor Minister Kuo Fong-yu. In an open letter, National Federation of Industries Chairman Rock Hsu said the new rules seriously restricted the flexibility of companies to assign overtime, making it harder for employers to schedule shifts and costing employees overtime opportunities, and he urged the government to ease the restrictions. With the rise in artificial intelligence and robots, it is becoming increasingly difficult to differentiate between white-collar and blue-collar workers, leading I-Mei Foods Co. President Luis Ko to wonder if the newly revised labor law is even applicable in today’s environment. ‘Flexibility’ a Blue-collar Worker Curse? The emergence of the knowledge economy and the growing diversity in how people work mean that the Labor Standards Act’s protections provided to workers are increasingly limited. ...the existing Labor Standards Act falls short because its definition of “work” remains stuck in the 20th century even as Taiwan moves toward a knowledge economy and away from its labor-intensive industrial past. AppWorks founder Jamie Lin, considered by many as a voice for Taiwan’s young generation of entrepreneurs, believes the existing Labor Standards Act falls short because its definition of “work” remains stuck in the 20th century even as Taiwan moves toward a knowledge economy and away from its labor-intensive industrial past. “The government simply doesn’t understand the difference between a laborer and a knowledge worker,” Lin says. When CommonWealth Magazine visited AppWorks three days before the start of the new Lunar New Year, its office on Keelung Rd. in Taipei was empty, its employees having already started a 19-day Lunar New Year holiday that the vast majority of Taiwan’s workers, whose vacation was limited to six days, would have envied. On normal work days, AppWorks employees can choose their work hours and the location (they can work from home) best suited to them, giving them the greatest degree of flexibility and freedom. Some in Taiwan fear that the concept of “flexibility” will turn into an accomplice used to squeeze blue-collar workers, largely because of the lack of mutual trust between labor and management in the country. Wu Zhou-ju, a member of the board of the Taiwan Pioneers of Labor Association, has concerns that typify the mistrust that exists. He contends that Taiwan’s labor laws are not comprehensive enough and are not strictly enforced, meaning that once the law allows flexibility for white-collar workers, blue-collar workers will face “forced” flexibility. 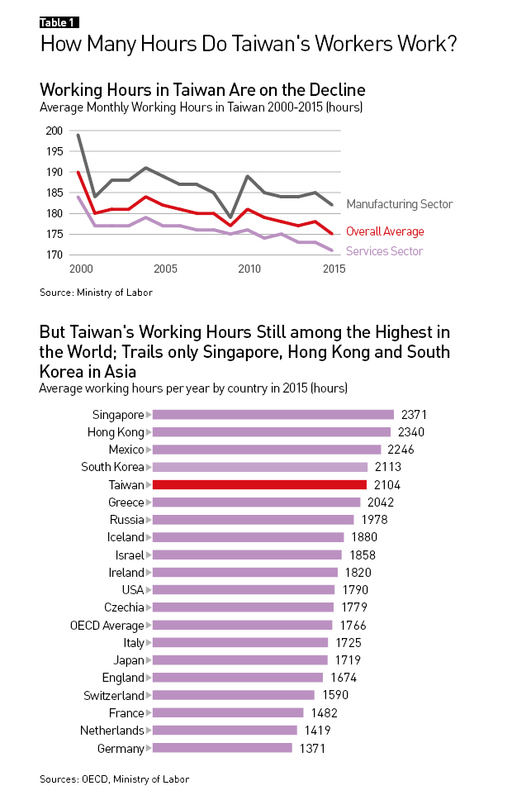 The recent revisions to the Labor Standards Act were driven in part by the fact that Taiwan consistently ranks among the countries with the longest average work hours in the world (Table 1). That, along with intense political wrangling during the legislative process, contributed to an ever more restrictive law seemingly out of kilter with the development of a knowledge economy. The revisions to the labor law that institute the five-day workweek, make it almost prohibitively expensive to have employees work on days off, and standardize the number of national holidays across the country (instead of different systems for government and factory workers) were pushed through by President Tsai Ing-wen and her Democratic Progressive Party’s large legislative majority. But they did not bring the government the praise it might have anticipated. At the root of the problem is the longstanding criticism of Labor Standards Act as defining labor from a purely manufacturing perspective. The law was essentially an extension of the “Factory Act” when first enacted in 1984. Its scope was then expanded in 1996 to allow businesses in certain sectors to set up more flexible work hours (Article 30-1) and stipulated that workers with “designated responsibilities” would not be subject to basic protections on working hours (Article 84-1). In 2000, the cap on working hours was lowered to 84 hours every two weeks, and that was further lowered to 40 hours a week under the Ma Ying-jeou administration in 2015, setting the stage for the controversial revisions pushed through by Tsai and the DPP in 2016 that further tightened restrictions on worker hours and overtime pay. Under the new rules, if an employee making NT$30,000 a month works eight hours of overtime on a “flexible” day off, the amount that person will receive for working overtime (in addition to their base pay) will increase from NT$584 previously to NT$1,584. Workers also cannot work more than four hours of overtime on a normal work day, and overtime hours are capped at 46 per month. Described as the biggest overhaul of labor laws in 30 years, the Labor Standards Act revisions will affect the rights of at least 10 million workers. “The idea behind the revising the law was to eliminate, transform and upgrade the country’s economic structure,” says Ho Pei-shan, a deputy secretary-general of the Cabinet who was involved in coordinating labor policy between the legislative and executive branches in an effort to push through the Labor Standards Act revisions. Although the law needed to be brought up to date with the times, there were also political considerations behind the move. According to Hsieh Chien-chien, the head of the Ministry of Labor’s Department of Labor Standards and Equal Employment, the main direction of the changes was based on the president’s campaign promises. Labor groups also repeatedly complained about some employers that had already adopted a 40-hour week work spreading the hours over six days rather than five, meaning that the concept of two days off per week had yet to be achieved, Hsieh said. Tsai’s labor policies were drafted by the DPP’s labor policy committee, which lacked members with actual business experience. It was convened by Lin Wan-I, a National Taiwan University sociology professor and now a minister without portfolio in the DPP government, and included Lee Chien-hung, an associate professor in Chinese Culture University’s Department of Labor Relations, and Taiwan Labor Front Secretary-General Sun Yu-lien. Still, Ho Pei-shan believes the DPP government had reached a consensus on the five-day workweek and vacation time before taking office on May 20, 2016. “The version arrived at by Lin Wan-I and labor groups, businesses and six major business associations agreed to one flexible and one mandatory day off per week and overtime pay that was 100 percent of regular salary,” Ho says. They also agreed to bring the number of national holidays down to 12 in line with workers and civil servants already on the 40-hour workweek. But the government hurt itself when Labor Minister Kuo Fong-yu initially promised laborers that they could still take off the 19 national holidays a year they enjoyed when the law capped working hours at 84 every two weeks before backtracking. That sparked fierce protests from some labor groups, and when the package of revisions reached the Legislative Yuan, labor was emboldened to push for better conditions and the opposition KMT and New Power Party demanded two “mandatory” days off per week, leading to constant deliberations between the Cabinet and Legislature that resulted in changes to the original consensus. During the contentious six-month process, “business groups kept criticizing the government for not sticking to the original consensus. But they forgot that in this era, administrative agencies do not have the final say. They need to learn to address and deal with different forces in society and even go to the Legislature to lobby for their position,” Ho says. Ultimately, the Cabinet dug in and set a five-day workweek with one “flexible” day off and one “mandatory day off” along with the same schedule of national holidays for all employees as its bottom line. “The DPP is a group of socially diverse forces. Civil groups have a lot of influence on us, and we had no choice but to make concessions,” laments Ho, who was a deputy director of the DPP Policy Committee before assuming her post in the Cabinet in June 2016. Partisan wrangling during the legislative process to revise the Labor Standards Act led to more generous terms for workers and a more rigid labor law. “The ‘power of citizens’ forged through social media and internet forces will challenge all of those in power and is something we have to face up to,” she adds. Taiwan Labor Front’s Sun sees the institution of the five-day workweek and an increase in overtime pay as positive developments, and he hopes the percentage of Taiwanese companies adopting a five-day workweek as standard practice will rise from the current 65 percent to 80 or even 90 percent. And in those cases where overtime or flexible hours are necessary, employers costs will have to go up. “Setting 12 hours as the maximum number of work hours a day is reasonable regardless of what industry you’re in. That is the significance of the Labor Standards Act,” Sun says. The new revisions may also indirectly boost job security and job opportunities. Josephine Chow, business leaders & consulting actuary at Willis Towers Watson, has been overwhelmed recently by companies asking for help designing preferential retirement plans to accelerate staff turnover and introduce new blood to cope with the need for transformation. “Employers will be more careful in taking manpower inventory and understanding manpower efficiency,” she says, which could lead to a better work-life balance for workers. Weaker enterprises that have relied solely on cheap manpower could be eliminated in this new wave of change, which is encouraging companies to make major improvements to productivity. “The government should introduce measures to help companies figure out how to become more efficient,” argues James Chien, the founder of human resources management company Mayo Human Capital Inc. One model Taiwan could follow, he says, is Singapore’s capability upgrading initiatives for small and medium-sized enterprises. But because the revised Labor Standards Act lacks flexibility, labor-management relations could become more rigid. Also, the revisions have been introduced at a time when businesses are facing the dual threat of low growth and a contracting labor force (Table 2) rather than in an era of economic prosperity, and there are few provisions focused on upgrading workers’ skills. So the question becomes where will the Labor Standards Act take Taiwan? Two potential challenges are especially evident. The trend toward temporary work among low-skilled workers could be accelerated. When former President Ma Ying-jeou was running for office in 2008, Pan Shih-wei, who would later serve in the Ma administration as labor minister and now teaches in Chinese Culture University’s Department of Labor Relations, drafted a white paper on the Ma campaign’s labor policies. In it, he predicted that atypical employment would surge and that manufacturers would turn to temporary workers en masse to handle urgent orders in the foreseeable future. He also expected wages and short-term benefits to be hurt by companies’ expectations of rising personnel costs. One company likely to live up to Pan’s expectations because of the new version of the Labor Standards Act is restaurant group Inkism International, which has over 120 beverage shops in Taiwan and has expanded into China. “Labor costs account for 25 to 28 percent of a beverage shop’s costs. Under the new five-day workweek rules, the cost of operating on holidays will be too high,” says the company’s CEO Ko Tze-kai, who has calculated that anything more than a 33 percent premium for overtime pay would not be worth it. “You have to give in to some degree, so the only option is to hire students to make up the hours,” Ko says. In fact, many city and county chiefs around Taiwan are concerned about what the potential consequences of the new rules will mean for their constituencies. One leader in northern Taiwan, speaking on condition of anonymity, said the vast majority of local businesses are small enterprises of 10 employees or less. “Ninety-seven percent of the businesses around the country are small and medium-sized enterprises. In establishing this new Labor Standards Act, why didn’t they seek out the opinions of mayors and county commissioners,” the source wonders. Even knowledge businesses, which are believed to offer better conditions to workers than those prescribed in the revised Labor Standards Act cannot escape the storm. Freddie Hoglund, the CEO of the European Chamber of Commerce Taiwan (ECCT) and a resident of Taiwan for 27 years, admits it’s the first time since he’s been in Taiwan that he’s seen the Labor Standards Act become such a hot topic. Hoglund had trouble understanding why labor laws were made so complicated simply because a few were abusing them. “I think you need to look at what the majority of companies are doing and allow people to operate on a reasonable, flexible basis, as opposed to making every single thing so tight. There’s no room for maneuver,” he said. According to Hoglund, the ECCT has often written in its annual series of position papers that labor regulations should distinguish between management and employees because people hired as senior executives don’t need the protection of labor laws to the same extent as an employee working in a factory. “We need to distinguish between senior management and laborers because right now the labor law applies regardless of their positions and ranks, and we think it is unreasonable,” Hoglund says, contending that it doesn’t make sense to have senior CEOs of multinational companies required to clock in and clock out. Startups tend to stress teamwork and self-initiative and embrace a much more flexible management strategy that may be at odds with the Labor Standards Act revisions. “Startup companies are in a race against time in their seed stage, but we are using the law to limit working hours,” says the head of a local government’s economic development bureau who is aggressively trying to attract startups. Under the new labor laws, startup models are having an increasingly hard time surviving. “Many people aren’t saying much publicly, but when the time comes, they may ‘vote with their feet,’” the bureau chief says helplessly. Lin Ching-I, a planning director at HCW Architects & Associates, has grown more nervous recently because international tenders are now being decided not only by a company’s size and reputation but also speed, especially when competing against Chinese teams, which tend to promise faster project completion times than their rivals. “For example, a person responsible for the design of a hotel lobby not only has to generate construction drawings but also detail drawings,” Lin says, noting that designers normally want to finish their jobs independently. During the process of economic transformation, applying a single Labor Standards Act to all sectors is becoming increasingly challenging because of the labor market’s need for flexibility on the one hand and considerations of worker security and protections on the other. By comparison, the “Fair Labor Standards Act” that exists in the United States establishes minimum wage standards and sets the workweek at 40 hours, but it does not put a cap on the number of overtime hours that can be worked. In addition, people with annual salaries of at least US$23,600 (or about NT$730,000) a year who perform specific executive, administrative or professional functions are exempt from the FLSA’s rules. Instead, they have to complete their job responsibilities in however much time it takes them, akin to Taiwan’s “designated responsibility” system. Instead of more restrictive labor laws, some advocate creating a labor-management consultation mechanism suited to the rapidly changing environment that would include an independent third party to insure that both sides’ wishes are respected. Hsin Ping-lung, a professor in National Taiwan University’s Graduate Institute of National Development and an expert on labor policy and labor economics, believes that only with this foundation in place can Labor Standards Act regulations be eased and then have the government compel labor and management to resolve problems through consultations. “If there is not a consultation platform and consultation mechanism, the odds of the government deregulating [the labor market] are slim and none,” Hsin says. Because in the past employers and workers both preferred to take their problems to the government rather than face each other, the government’s role evolved from being a “neutral mediator” into a “party involved in the dispute.” But for problems to be truly solved, Hsin says, labor and management have to be willing to sit down together and talk things out. Based on its name as the Labor “Standards” Act, the Act might be best served playing the role of setting the most basic protections for workers in a way that does not affect the vast majority of organizations, and leave other rights and responsibilities to negotiations between labor and management. The problem with that philosophy, however, is the generally limited footprint and power of labor unions in Taiwan. There are more than 1.35 million companies but only 5,466 unions throughout the country and only 919 company unions. In addition, only 147 collective bargaining agreements have been signed, an indication of how far there still is to go. 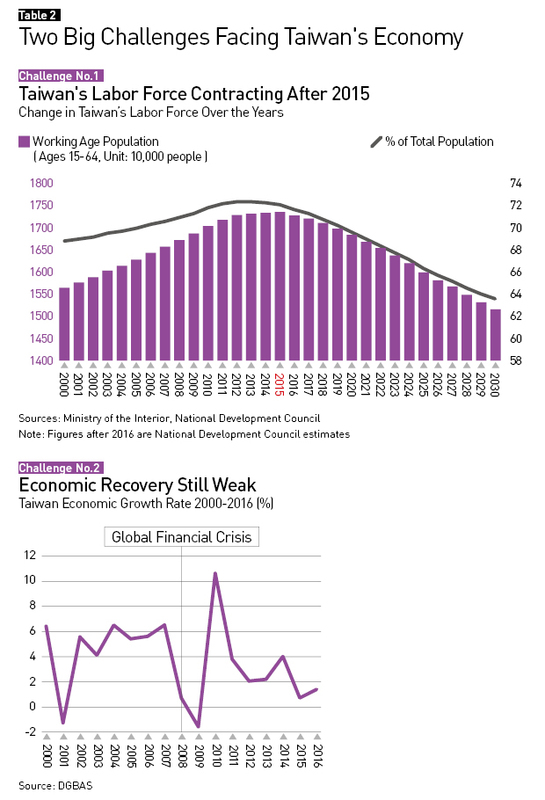 Ultimately, the question Taiwan more urgently needs to resolve is the country’s persistently low wage level. The 29-year-old Wu Zhou-ju, who has engaged in labor union activities after attending graduate school, feels low wages have affected the labor policy debate. “If there was enough money, you wouldn’t have to use hours worked to calculate wages or be forced to reduce working hours to get more time off,” says Wu, who feels that the Labor Standards Act has become increasingly strict because labor is vulnerable, there are no strong labor unions, and average wages continue to lag. Ultimately, businesses have the power to solve the problem and should take steps to do so, and the government must also take tangible actions to stimulate the economy. Without such a concerted effort, all of the stakeholders in Taiwan’s turbulent labor environment will end up worse off than ever.